through the concert, silent auction, and your contributions! And all of you who supported, donated, spread the word, and sent your words of encouragement--Our sincere gratitude! "Please convey my gratitude to all members of your team but also to the jazz band, friends, and to all those who brought their support and sympathy in one way or another. I am very excited about seeing the first order of mosquito nets and the distribution that should happen by the end of May--at last. 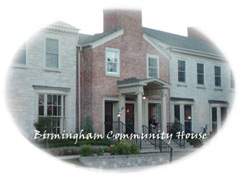 The Birmingham Community House provided excellence service, an elegant atmosphere, along with generosity and superb assistance to make the jazz concert event a success! Dr. Cissa Wa Numbe attended the jazz concert, and briefly shared about the malaria prevention campaign for the eastern border of the Congo. Link to a video by Dr. Cissa Wa Numbe giving an overview of UNA-DRC's activities to the graduate student team in Geneva, Switzerland at our initial Global Learning project (AmaniDRC) partnership meeting. With great pleasure, we were honored by his visit. 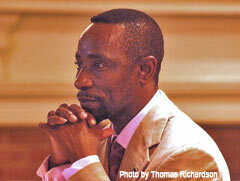 Note: Link to: Dr. Wa Numbe's Detroit/Flint speaking itinerary of March 31 to April 3 in Detroit and Flint. Concert proceeds will be used mosquito bed nets to be distributed for free near the eastern border area of Congo. Journalists are describing eastern Congo as being 20 times worse than Darfur -- and the worse genocide since World War II.